"It's all about Pinstripe. As much as I like Mozilla, it's ugly without Pinstripe, and looks like a proper OSX app with it." Pinstripe is a Mozilla theme made to match the look and feel of a native Mac OS X interface. The theme was designed to compliment both the Aqua and graphite OS appearances. If you're using an alternate theme engine such as Duality, Pinstripe will not honor your theme prefs for the toolbars, but may render some of widgets based on your theme. Click here to install the Pinstripe theme. This theme is subject to the Mozilla Public License Version 1.1; you may not use this file except in compliance with the License. If you plan to create a theme based on Pinstripe or want to distribute Pinstripe with your product, please email me and let me know. Made browser tabs smaller and put the tabs in front of the bottom border. New "show toolbar as" feature implemented. Check it out in Preferences under Appearance. Mainly worked on layout of UI controls and positioning of elements to bring Pinstripe more in line with the Aqua HI Guidelines. If you see anything in the interface that doesn't look right, please let me know. 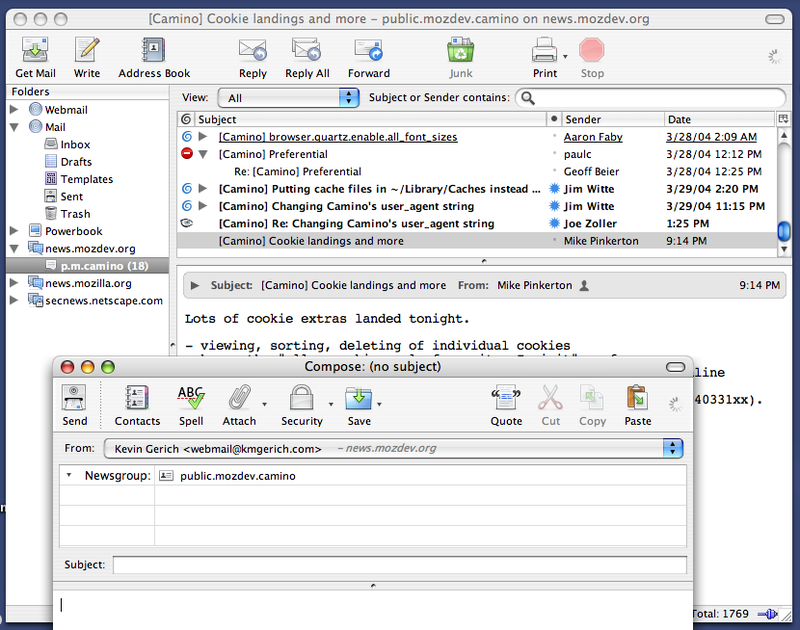 hid toolbar separators in mail compose window after reading mpt's blog. Finally. Here's a version of Pinstripe for the Mozilla suite. I'm not done yet but I thought I'd share what I have so far. The status bar icons need some work. I didn't touch the Composer or Chatzilla components so they still have a partially Classic look. Click here to install. Mac OS X only please. The new icon hasn't made its way into the Mac OS X Thunderbird nightly builds yet, but when it is included it will be a great compliment to the new Pinstripe theme. Note: The Firefox UI may appear broken if you are using a previous version of the Pinstripe theme. Go into your theme preferences, select "Firefox (default)", then close and reopen the browser to make sure you are using the latest incarnation of the Pinstripe theme. The newly released Mozilla Firefox 0.8 has a new look on Mac OS X. It is the first Firefox milestone to be released with the Pinstripe theme as the default. Here are a few screen shots. Screen shots of Firefox on Windows can be found at Neil's World.